Background: The Custer Association of Great Britain (CAGB) had its first formal meeting on the 10th June 2000 after a core of fellow enthusiasts who had up until that date met on a regular but informal half-yearly basis since 1998 at a college in Birmingham decided in November 1999 to establish a more formal organisation. We are a diverse group of individuals who have a common fascination for the life and times of George Armstrong Custer, the Battle of the Little Big Horn, the Plains Indian Wars in general, the culture of the tribes involved and their leaders; Sitting Bull, Crazy Horse, Two Moons and Gall. Prior to the first meeting, the majority had developed this interest either in isolation or were members of the English Westerners' Society, which covers America's Frontier history across a broader spectrum. Some had also joined the Custer Battlefield Historical & Museum Association (CBHMA) or Little Big Horn Associates (LBHA) but had had few opportunities to participate in events in the United States. After an initial gathering it turned out to be much more enjoyable meeting together and indulging in our hobby. The CAGB is a non-political, non-profit making and open-minded organisation. Meetings (we call them 'Gatherings') are held twice a year for a full day, usually in May/June and November, in different parts of the country, each of which includes a number of presentations and discussions on related subjects. Membership: Subscriptions for 2018 and 2019 are £9 for residents of the United Kingdom, the Channel Islands and the Isle of Man and for those residing in the Republic of Ireland and elsewhere in mainland Europe it is £9 or 11 Euros. For the rest of the world it is $18.00. Subscriptions are due annually as at the 1st January. Please note that because we have now moved to one TCN per annum and the delay in publication of the 2017 issue the cost of subscriptions have been reduced with effect 1st January 2018. Members who have not paid their 2017 subscription it is still at the old rates of £12.50 for UK, $25.00 for rest of the world except Europe and Republic of Ireland which is either £12.50 or 15 Euros. Members who join after 1st January will receive The Crow's Nest regardless of when they join the Association within the Membership Year, which in future will run from 1st January to 31st December. Subscriptions cover administrative costs (predominantly mailings), the publication of the CAGB's Journal, The Crow's Nest and the maintaining of this website, which contains details of events, links to other related sites, useful information about travelling to the USA and book and film reviews. Committee: The CAGB is run by a small committee of the members who carry out the functions of Chairman, Vice-chairman, Secretary, Treasurer, Webmaster and Event Co-ordinator. The committee are elected at the Annual General Meeting in November, their appointments will begin on the 1st Jan in the following year. Editorial Team: In addition to the committee we currently have a small editorial team, Kevin Galvin and Mary Christian, who put together The Crow's Nest. Honorary Office Holders: Our first president Francis Taunton relinquished his appointment after seven years, his successor in November 2007 was Derek Batten, our current president. Derek was a founding member of the CAGB and one of our original Vice-presidents, the other original vice-president being the late Joan Croy. Joan sadly passed away on 11th May 2017, she was also one of the CAGB's first overseas members and was not only a staunch supporter of the CAGB but a person who always made you welcome whenever she met you. The late Joan Croy - One of the CAGB's original Vice President's who sadly died on 11th May 2017. At the AGM on Saturday 6th November 2010 Sandy Barnard and another founder member, Peter Russell, were also appointed as vice-presidents after accepting invitations from the the Chairman. Sandy has been a great supporter of the CAGB having presented at three of our Gatherings in the UK, the last being on 5th November 2011 in London. Peter, also a tireless contributor to The Crow’s Nest and long-time committee member, retired as Vice-president in 2011. As stated above, the CAGB held its first formal meeting in June 2000 and first presented a copy of a draft Constitution to the Gathering held in May 2005. After a full discussion on its contents some minor changes where made and the amended version was ratified at the Annual General Meeting that preceded the Gathering in Birmingham, 12th November 2005. Subsequent changes in the composition of the committee has resulted in some minor changes being necessary and this resulted in a Draft Version 2, as a result of the 2015 AGM further changes were agreed which included changing the membership year to run from 1 January to 31 December. A rewrite has been undertaken and will be published to reflect the new version and publication of The Crow's Nest moving to an annual publication. The Crow's Nest, Volume 14, Number 2 (Autumn/Winter 2014-15) was dispatched to all those members who have paid their subscription for 2014-15 (Extended Membership Year). Volume 15, Spring/Summer/Autumn 2015 has been published and completed the publications for the extended membership year 2014-15. Volume 16 is a single 48-page volume for membership year 2016 and has been dispatched to members. Volume 17 for the membership year 2017 is being edited. It will feature the art of Joe Grandee on the front cover. The Crow's Nest Index lists the contents for the 27 issues published to date. Reports from previous Meetings and Gatherings. Three publications from the English Westerners' Society relate to George Armstrong Custer and the Seventh Cavalry. All are written by distinguished authors and researchers, Two of whom are also members of the CAGB, Barry C. Johnson and Jeff Broome, and the late Peter Harrison was a member before his untimely death. His years of research into the life of Monahsetah may not have been published had it not been for the diligent work of his friend and the CAGB Chairman Gary Leonard who edited Peter's work. Credit must also be given to Peter Russell who supported Gary through the editorial process. 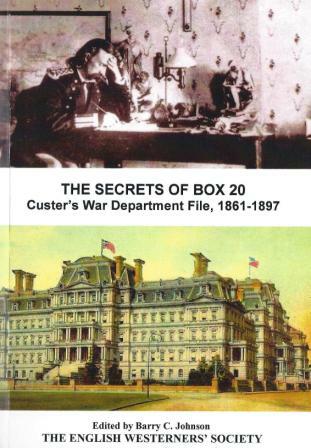 The first is the second volume of their Golden Jubilee Publication The Secrets of Box 20: Custer's War Department File 1861-1897 edited by Barry C. Johnson including Foreword and Introduction is a Special Publication and Volume 2 of the Golden Jubilee Publication. Although General George Armstrong Custer's personal file has been available to researchers since the 1950's , up until then all were regarded as confidential, there was very little interest in Custer's file and Johnson explains why. The importance of this work however is the methodical way that Johnson has put this publication together. First explaining the how the Adjutant General's Office (AGO) compiled such records known as A.C.P. files after "The 'Appointments, Commission and Personal Branch" whose responsibility it had been to maintain the files. Then he assesses the the contents of Custer's file, which contains very little information regarding Custer's campaigns or battles, before giving readers an insight into the AGO in Custer's time. The file itself is published in chronological order as the original file had been kept loosely and had clearly resulted in the files themselves becoming disorganised. The formatting of the original files has been retained included the spelling and it is believed this publication is the first time that the files have been reproduced in print. The second is a Brand Book is Wild Bill Hickok's Hays City Brawl with Soldiers of Custer's 7th Cavalry (Volume 45, Number 1) by Jeff Broome. 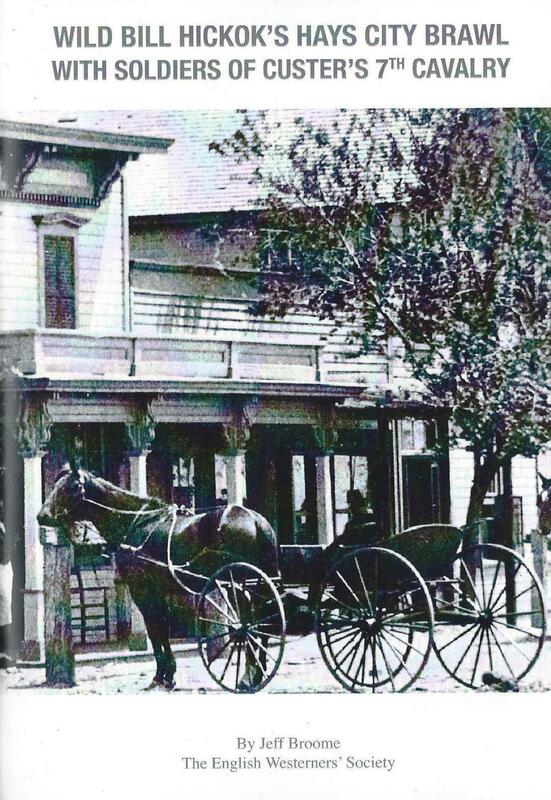 This account of of the famous brawl outside Tommy Drum's Saloon in Hays City, Kansas on 17th July 1870 between "Wild Bill" Hickok and members of Company M of Custer's Seventh Cavalry is well-known. Company M were commanded at the time by Thomas Ward Custer, the General's younger brother, who would also meet his death at the Little Bighorn in 1876 in the same year that Hickok would die after being shot in the back in Deadwood. The author has worked tirelessly to uncover the facts, made challenging by the various but widely false accounts perpetuated over time. The discovery in 2000 of Sergeant John Ryan's memoirs by Sandy Barnard and subsequent publication helped to shed new light on the incident but also on the two soldiers; John Kile and Jerry Lonergan. This book provides a reader with a much richer picture of these two men, in particular Kile, as well as clearing up the facts of the fight. The third is a Special Publication that celebrates the Diamond Jubilee of the English Westerners' Society, Monahsetah: The Life of a Custer Captive by Peter Harrison and edited by Gary Leonard. Monahsetah, or Meotzi, was a young Cheyenne Indian woman captured by the 7th U.S. Cavalry following Custer's attack on Black Kettle's village on the Washita River in November 1868. Controversy has existed for decades over the question of whether Custer procured some sort of sexual relationship with Monahsetah and whether she bore a child by him. The book allows the reader to make up his or her own mind on this issue. It also fleshes out her long and adventurous life. In addition to her experiences at the Washita, she was wounded during the Sand Creek massacre, helped Custer procure the release from the Cheyennes of two women, was involved in the rescue of two of the German girls, and lived through one of the most tumultuous eras of Cheyenne history. She also was married several times. Her first husband was the son of Cheyenne Chief White Antelope, while later husbands included a retired mountain man, and a former Fort Marion captive who was later a scout for the Army. Please contact the Secretary if you wish to obtain these publications. Our next 'Gathering' takes place on Saturday, 18th May 2019 in London, members of the English Westerners' Society have been invited to attend. The guest speaker will be Michael Donahue who is not only an accomplished artist but for two decades has been a seasonal National Park Ranger at the Little Bighorn Battlefield National Monument. His first book Drawing Battle Lines-The Map Testimony of Custer's Last Fight was published in 2008 and his latest book Where the Rivers Ran Red: The Indian Fights of George Armstrong Custer in 2018. Members of the CAGB who wish to obtain a copy of the latest book can place an order with the Secretary of the CAGB, Kevin Galvin. This will be the paperback version and priced at $36.95 (approximately £29 but subject to currency fluctuations, postage and packing will be confirmed once new UK postal rates are published). Please note Mike will only be able to bring a small number of books with him so members need to order their copy early and orders will be based on the first come, first served principle. A set of three David Shanahan prints are now available. These prints are be limited to 100 and funds raised will be used to support the Fort Abraham Lincoln Foundation. This is a series produced in association with the English Westerners' Society. Members of the CAGB can purchase copies of each volume at the subscriber's rate. An introduction to the series is at British Custeriana Series. Copies can be obtained from the Secretary. Upton & Sons Publishers. Richard Upton a long time member of the CAGB has a comprehensive selection of books related to the Custer Fight and much more. Please visit their website for more details. A new publication Where the Custer Fight Began: Undermanned and Overwhelmed The Reno Valley Fight by Donald W. Moore, which is Volume 10 in the Battle of the Little Big Horn Series can be pre-ordered now. AST Press. Sandy Barnard who is another member of long standing and one of the CAGB Vice-presidents has a large selection of Custer and other Indian wars related books and journals available including his own books. Sandy Barnard's latest book is A Hoosier Quaker Goes to War: The Life and Death of Major Joel H. Elliott, 7th Cavalry and tells the story of this officer serving with Custer's Seventh Cavalry when he was killed at the battle of the Washita. Elliott had served with distinction during the Civil War which for a young man brought up in a closely-knit community of decidedly pacifist Quakers was remarkable. This book is available direct from AST Press or can be purchased via Amazon. 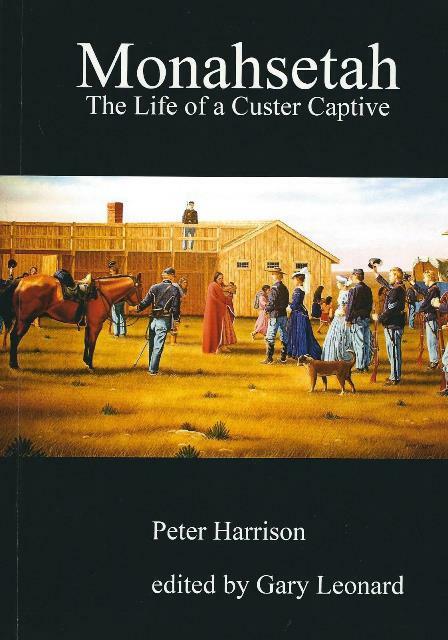 Steve Alexander - has now had two books published by Andrea Press, the first was G. A. Custer to the Little Big Horn. This was available from Casemate Publishing in the UK. This is a well crafted book that is full of excellent illustrations, many in colour, that tell the story of George Armstrong Custer from his birth to that final day at the Little Big Horn. His second book is Believe in the Bold: Custer and the Gettysburg Campaign. The book is available direct from Andreas Press or can be purchased on Amazon. James Donovan - A Terrible Glory: Custer and the Little Bighorn - The Last Great Battle of the American West published by Little, Brown and Company and available through Amazon or in the UK is often found on the bookshelves in Waterstone's. It is now also available in paperback. This is a comprehensive study of the battle that draws on primary sources as well as new forensic research. A review appeared in The Crow's Nest (Volume 9 Number 2). Vincent A. Heier - Little Bighorn is published in the Postcard History Series by Arcadia Publishing and is a fascinating examination of Father Vince's unique collection of postcards that have been produced and helped preserve the image of the Little Bighorn over time. French L. MacLean - Custer's Best: The Story of Company M, 7th Cavalry at the Little Bighorn. Company M were commanded by Captain Thomas French and the First Sergeant was John Ryan. For whatever reason not one of Company M received a Medal of Honor for their conduct at the Little Big Horn but French believes that 10 of the company should have been awarded the medal including both French and Ryan. The book is published by Schiffler Publishing Ltd and is distributed in the UK by Bushwood Books. Custer's Southern Officer: Captain George D. Wallace, 7th U.S. Cavalry by John D. Mackintosh reviewed by Francis Taunton. Custer Victorious: The Civil War Battles of General George Armstrong Custer by Gregory J. W. Urwin reviewed by Kevin Galvin. Red Sabbath: The Battle of the Little Bighorn by Robert Kershaw reviewed by Francis Taunton. Reviews are the comments of the reviewers only and ultimately we always recommend that you read the books for yourself and make your own judgement. Members are requested to submit reviews of films and videos (including documentaries) that deal with Custer's life, or are associated with the Plains Indian Wars, 1866-1890. For members in the United Kingdom two DVD's (Region 2) are now available - Sitting Bull first screened in 1954 and J. Carroll Naish starring in the title role and 7th Cavalry released in 1956 and starring Randolph Scott as an officer who returns to Fort Abraham Lincoln in the aftermath of the Little Bighorn and is accused of cowardice. Note the quality of the Sitting Bull DVD is a poor digital copy of the original. Neither film can claim to have based their scripts on actual historical events that occurred but are relatively entertaining and may well have been responsible for some in becoming life-long students of the Little Bighorn battle. Members are requested to submit articles for publication to Kevin Galvin. Guns at the Little Bighorn. By Mark Gallear. On the Little Big Horn and the Rosebud. By Ken Doran. An account of the 125th Anniversary Event at the Little Bighorn Battlefield and the U.S. Army Staff Ride on the Rosebud. Trip of A Lifetime. By Gordon Richard. An account of his trip with his brother to the American West in the summer of 2006. The CAGB Polo Shirts are available in three sizes; Medium, Large and Extra Large. Each Polo Shirt is emblazoned with the logo illustrated. Anyone interested should contact Kevin Galvin. The unit price is £16.00 including postage and packaging. Members can also purchase a shirt at any ‘Gathering’ when the cost will only be £13.50, due to there being no mailing costs. Overseas members should contact Kevin Galvin by e-mail to confirm method of payment and cost, which currently is approximately $35 with postage and packaging. Members are requested to submit photographs for publication to Kevin Galvin for the CAGB Photo Gallery. For anyone with money to spare and as a worthwhile investment, they could buy one of Mari Bolen's excellent sculptures of George Armstrong Custer. This superb work and is in a limited edition of 25 pieces. There is also a series on the Plains tribes - this will be a full body piece for each of the 34 tribes that Mari intends to sculpture. There have been numerous works of art produced since the demise of George Armstrong Custer and his 5 companies of the 7th U.S. Cavalry and by searching the internet looking for images they can be found. There are number of sites which are recommended so if you have the money why not invest in a print by any of the artists whose website is listed here. Mark Churm who has produced three paintings related to the Little Bighorn so far on the subject and are available as prints. The late Eric von Schmidt who produced Here Fell Custer that was used as the front and back cover for Volume 4, Number 1 of The Crow's Nest. Paul Smiley a US artist has produced two Custer paintings - one showing GAC in Civil War uniform and the other in his study - see both paintings. Paul is happy to take commissions to paint historical figures. Ken Ferguson provided the artwork for the back cover of The Crow's Nest (Autumn/Winter 2007, Volume 7, Number 2). You can see more of his work at www.kennethfergusonfineart.com. Another artist whose work has featured on the front and back cover of a number of issues of The Crow's Nest was Michael Schreck. His work has also featured extensively in the CBHMA journal the Greasy Grass and on the cover the LBHA bi-annual journal the Research Review. To see more of his work visit his website at http://michaelschreckart.com/index.html. Jim Carson whose artwork has graced the front cover of two issues of The Crow's Nest; Retreat to Last Stand Hill (Winter/Spring 2013, Volume 13, Number 2) and Dispatch to Benteen (Spring/Summer 2014, Volume 14, Number 1) has a significant portfolio of Western Art and his website at http://www.jimcarsonstudio.com is well worth viewing. Jerry Thomas' painting of Get 'Em Boys that portrayed Captain Albert Barnitz and Bugler Charles Clarke leading a formation of 7th Cavalrymen in an engagement with Cheyenne outside Fort Wallace, Kansas in 1867 featured on the cover of The Crow's Nest (Spring/Summer 2007, Volume 7, Number 1) and The Victor on the cover of the Autumn/Winter 2012 (Volume 12, Number 2) issue has his Gallery in Scott City, Kansas (a view of which appears below). One of his most recent works Toward the Valley features on the front cover of the Spring/Summer/Autumn 2015 issue (Volume 15). Jerry's work can also be viewed online at www.jerrythomasartgallery.com. In Volume 13, Number 1 (Spring/Summer 2013) issue of The Crow's Nest the front cover featured the painting "Come on You Wolverines" by Don Troiani. Don has produced other superb work on the US Civil War and his paintings can be viewed by visiting the Military and Historical Image Bank website. For those UK members visiting the USA and locations associated with Custer it is intended to provide details of places to stay or visit that are based on the views of members. Ultimately where you decide to base yourself when travelling to the USA from the UK (or for our U.S. members) is a decision for the individual or group concerned. The 7th Ranch run by Chip and Sandy Watts lies near Little Bighorn Battlefield and is also home to the Greasy Grass Scouts – a cowboy action shooting club devoted to keeping the Spirit of the West alive through re-enacting and single action shooting. They do both mounted shooting and ground shooting with old-style guns in 1880s attire. The Grandview Campground in Hardin, Montana, provides accommodations close to the battlefield. There are a number of websites that are dedicated in whole or part to the Little Bighorn battle and the life and times of George Armstrong Custer. 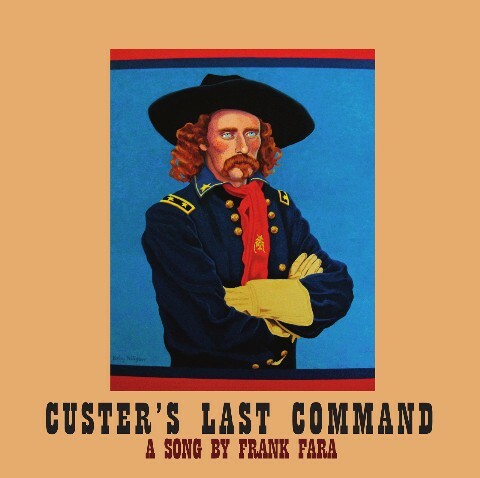 These can be found on the Custer Related Links to Other Sites page.